St. Aloysius is a thriving Catholic parish and grade school located in Pewee Valley. Originally founded in 1865, St. Aloysius has been located in Pewee Valley since 1913. Now home to over 1,600 families, our community continues to expand and grow thanks to the spirit and generosity of our members. If you are interested in joining our parish, let us know. 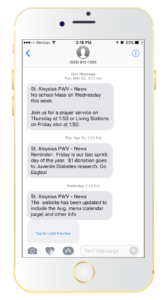 We use Flocknote to keep everyone up-to-date on all of the various things going on around the parish. Your info is kept private and you choose precisely which groups and ministries you want to get email and text messages from.